Continuing our previous guide on how to participate in the Attack on Titan Event in MapleStory, we will show you the activities your MapleStory Mesos hunter can do. Note that these are for the main event and not the other small quests and events players can do in update 159. The main Attack on Titan event starts with the entry quest given by the event notifier. From there Maplers will have to finish a small jump challenge to get into the other world. In there, you will have to go through a brief tutorial orienting you on the mechanics used by the event including rock-paper-scissors training, using the omni-directional maneuver gear and more. After clearing the tutorial you can then progress to the three episodes that make up the main event. The first event is The Fall of Shiganshina, followed by Cadets Corps Daily Routine. The third and final event is The Battle of Wall Rose. Note that these episodes require Play Coins to participate in. Completion of these will reward the player with themed MapleStory items. The first episode of the main Attack on Titan event is similar to the jump challenge encountered to get the other world. The second episode however is broken into four different mini-games all with titles beginning with Training Corps and uses Training Coins. The first of the mini-games is Training Corps – Mobility Training. In here Maplers will have to catch Well-Steamed Potatoes while avoiding other objects that are falling, all within three minutes. The next mini-game is ODM Training. This mini-game will have your character take out wooden Titan mock-ups with the help of the Omni-Direction Maneuver gear. Players will need to take out all targets within five minutes while avoiding plummeting to their deaths. Training Corps – Hand-to-Hand Training is another of the mini-games in the second episode. This is a simple Rock-Paper-Scissors battle which is technically done hand-to-hand. The last training mini-game Combat Training however pits players against another team. Each team needs to rack up more points than the other by dealing damage to a fake Titan within a limited time period. Update 159 for MapleStory added events from the popular anime Attack on Titan. Through these events themed MapleStory items as well as MapleStory Mesos can be earned. We’ll cover the basics of how to participate in the event today. We’ll also go over the all important Coins this event uses. With the success of the previous anime crossover, MapleStory is gave Maplers who love anime another treat. The newest update introduced the Attack on Titan event so players can experience the ups and downs of being a Cadet Corps member. The Attack of Titan main event will be running from January 21 until February 18. Note that only characters at or above level 30 can participate in the event. Players will also need to have Play Coins ready to access the special content. Like with most events, interested players will need to accept the quest via the event notifier on the left side of the screen. In this case, pick the Attack on Titan event and subsequently, the [Attack on Titan] Who Are You? quest. Next, your character will need to make his or her way across the gap between the Other World and Maple World. Once there, your character can access Attack on Titan content. Note that once this entry quest has been done, players can use the Dimensional Mirror to directly access the event contents. Maplers will need to have Play Coins in order to access the Attack on Titan content beyond the initial tutorial quests. These coins come in two types: Training Coins and Wall Coins. The two can be obtained by playing through Attack on Titan events. The MapleStory Cash Shop also sells Coin Exchange coupons that will give player Play Coins once exchanged in-game. MapleStory Mesos Fans! It’s Time to Join the Cadet Corps! MapleStory is giving anime fans another treat with another Maple World cross-up with anime. This time Maplers get to experience the world of Attack on Titan in-game. To be launched on January 21, players can get exclusive MapleStory items and mesos through special themed content. Starting January 21, Maplers can enter the world of Attack on Titan to embark on an epic adventure. The portal that links the Maple World to this dangerous world however is only accessible to characters level 30 and above. Once inside, Maplers must use special Coins to play through the themed content. Events and quests in the world of Attack of Titan will have players battle the fearsome creatures alongside familiar faces. Enlist in the Cadet Corps and take on the Titans with Eren, Mikasa and Annie by your side. Maplers are certainly not prey and players can prove this in a series of quests and challenges. Players can head to the top of Wall Rose to fend off the Titan invasion. Equip your very own omni-directional mobility gear and show the Colossal Titan just how the real hunters are. While being able to experience the world of Attack of Titan with your own characters is a reward in itself, there are many items that await brave Maplers. Finishing quests and winning the challenges will reward players with MapleStory Mesos and exclusive items. These include specially themed medals, totems and more. 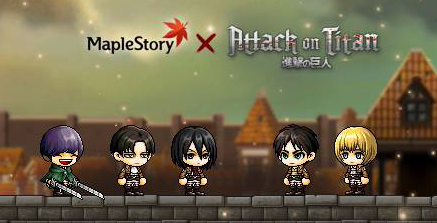 The MapleStory Cash Shop will also have exclusive Attack on Titan inspired items. Players can buy covers and styles that will make them official members of the Cadet Corps, complete with their own omni-directional mobility gear. You can even make your character look like Eren, Mikasa, Armin or Levi. There will also be chairs and accessories all Attack on Titan themed! Posted on January 21, 2015 Author adminCategories Events, guides, maplestory, Maplestory Guide, mmorpg, news, nexon, online game, pc game, tips, UpdatesTags 2d side-scroller, attack on titan, free guide, freeplay, game, guide, maple world, maplestory, maplestory items, maplestory mesos, mmo, mmorpg, nexon, pc, pc game, rpg, shingeki no kyojin, side-scroller, tips, UpdateLeave a comment on MapleStory Mesos Fans! It’s Time to Join the Cadet Corps!